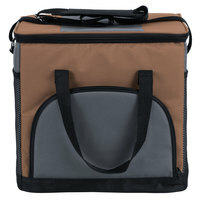 Transport foods and drinks and keep them at the right temperatures with this Choice brown insulated cooler bag! 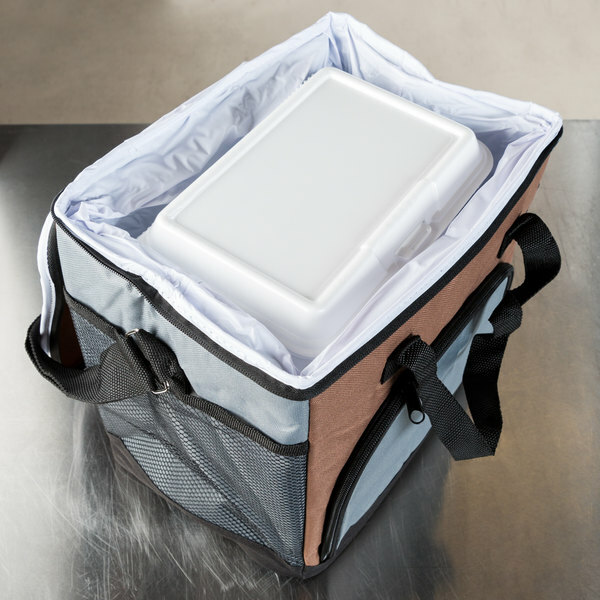 This Choice insulated cooler and sandwich bag is convenient for a variety of applications, whether you are catering an outdoor event, planning a day out for your retirement community, or organizing a recreational activity. Its roomy interior holds up to 24 cans or a combination of beverages and sandwiches. 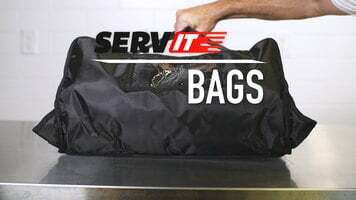 "I have 4 of these bags and they're great. sturdy, lightweight (but very strong) and keep things cold for hours and hours. such a good deal." 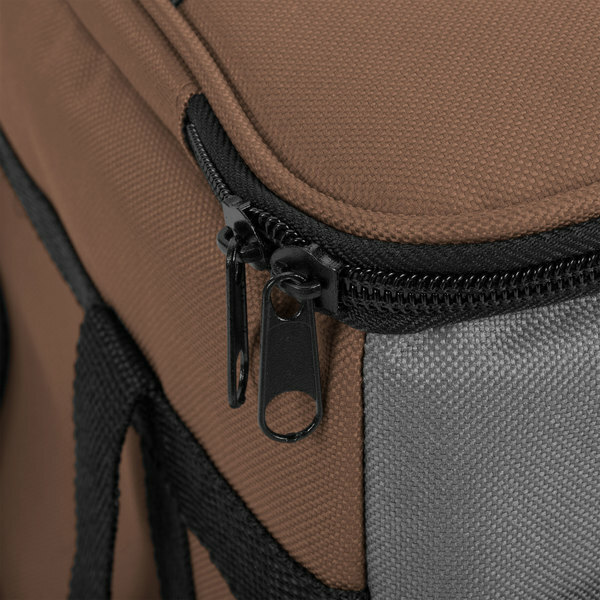 This bag's durable nylon construction is built to last, while the brown color has a warm, rustic look. Mix and match it with other colors (sold separately) to specify food contents. 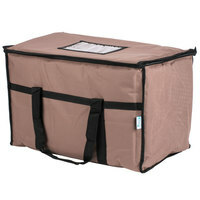 The soft-sided, insulated walls help protect food or drinks from damage while keeping cold items cold or hot items hot. Additionally, the innovative heat sealed lining keeps moisture and liquids in the bag to reduce mess or spills. The interior is easy to clean for added convenience. 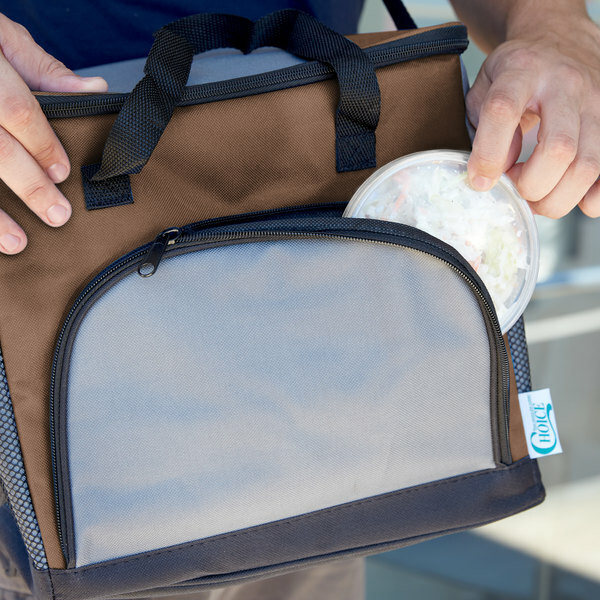 Place bottle openers, napkins, or utensils in the enclosed front pocket so they don't fall out, and fill the elastic mesh side pockets with small snacks. 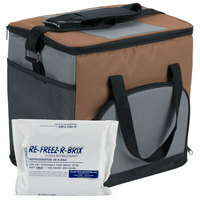 Leave your other bags at home and use this insulated cooler bag to keep everything you need in one convenient location! 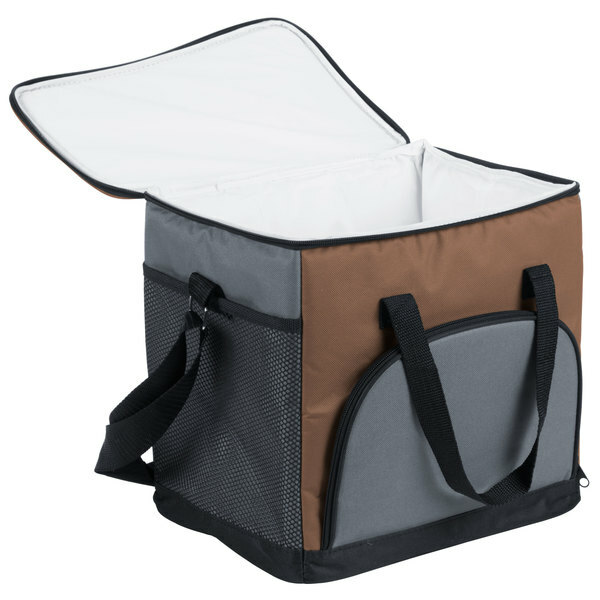 What types of items will fit into this small Choice cooler bag? 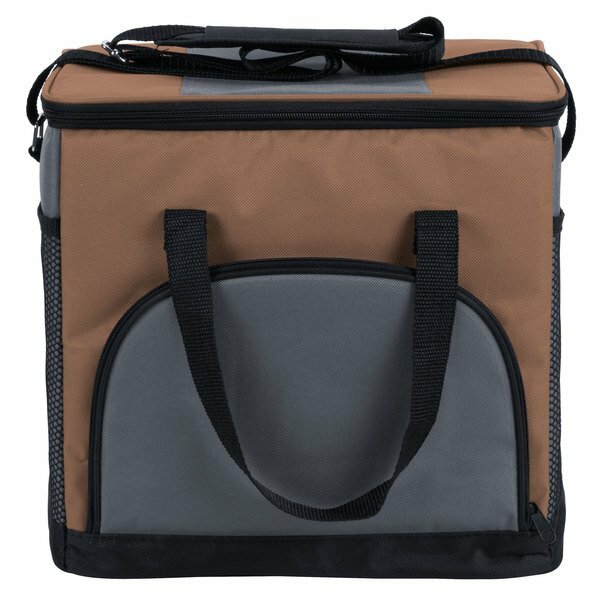 What Fits Inside a Choice 12" x 9" x 11 1/2" Insulated Leak Proof Cooler Bag? 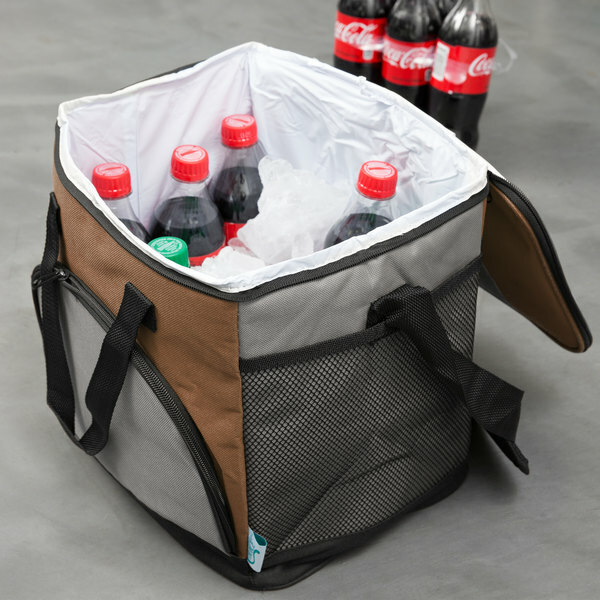 Your transport needs are always changing, and with this Choice cooler bag, you'll be set to accommodate a variety of beverage and food containers with ease! Check out this short video to find out more. 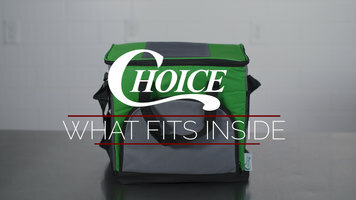 Choice insulated and leak-proof cooler bags are designed to accommodate a variety of items to best suit your ever-evolving needs. For instance, this 12" x 9" x 11 1/2" bag can fit up to 24 beverage cans or (3) 9" x 6" x 3" takeout containers. To provide an additional storage option, (6) 24 oz. deli containers also fit in the bag. 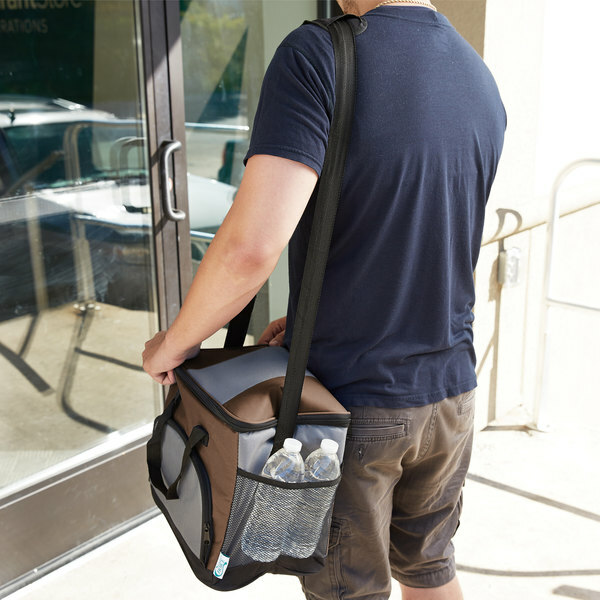 Such variable capacity ensures that a Choice cooler bag is right for you - regardless of what you need to transport! 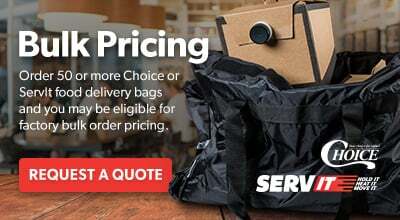 Item #: 124FCARRBR Choice Insulated Food Delivery Bag / Pan Carrier, Brown Nylon, 23" x 13" x 15"
Item #: 124FCARKITBR Choice Insulated Food Delivery Bag / Soft Sided Pan Carrier with Foam Freeze Pack Kit, Brown Nylon, 23" x 13" x 15"
Choice Insulated Food Delivery Bag / Pan Carrier, Brown Nylon, 23" x 13" x 15"
Choice Insulated Food Delivery Bag / Soft Sided Pan Carrier with Foam Freeze Pack Kit, Brown Nylon, 23" x 13" x 15"
Choice Insulated Food Delivery Bag / Pan Carrier with Microcore Thermal Hot or Cold Pack Kit, Brown Nylon, 23" x 13" x 15"
I bought these to help deliver frozen meals to my customers. 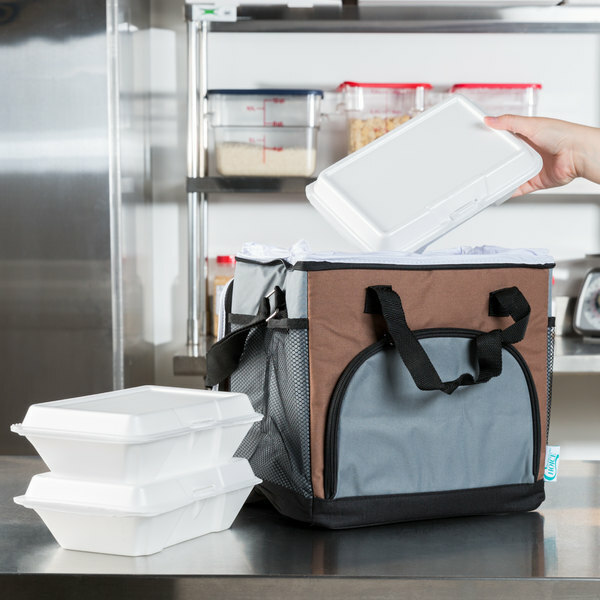 They are larger than I would have liked to use to give my customers but they do keep my food cold in the short time I need to use them. I was pleasantly surprised by how good this bag is. I've used it a couple time to keep my food cool on a long drive, and it worked nicely. Really like that it has a good amount of pockets. I have 4 of these bags and they're great. 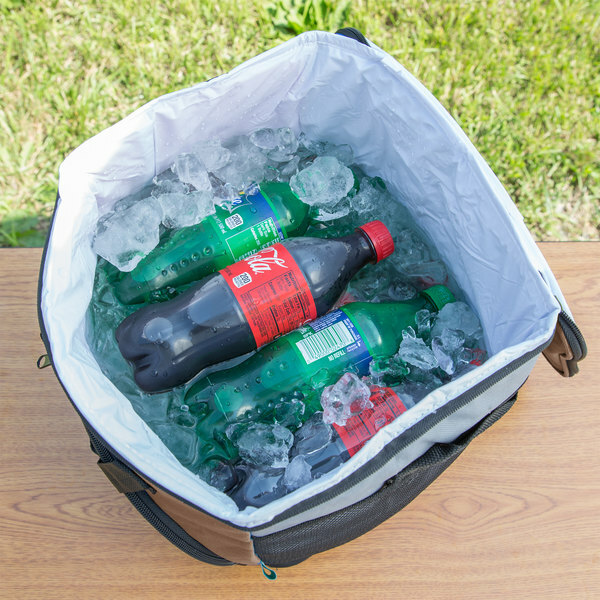 sturdy, lightweight (but very strong) and keep things cold for hours and hours. such a good deal. 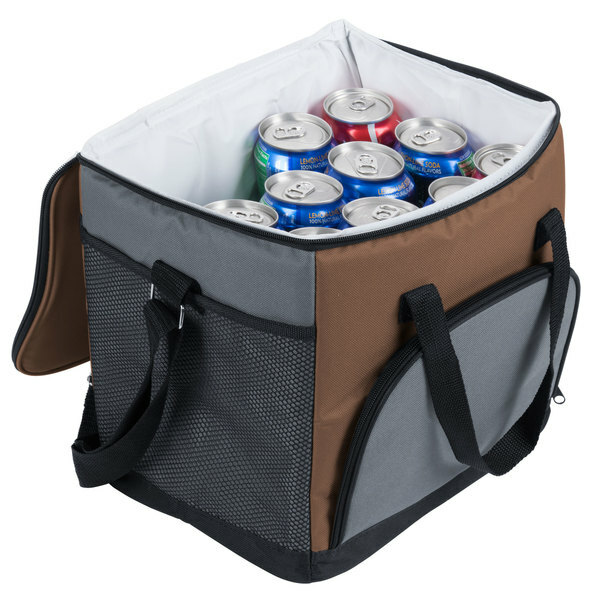 Nice basic Insulated cooler, this is a great size, and folds down flat good too. great to take to the store with you to put all of your cold items in! A wonderful bag. We use these with a combination of the versatainers 838 and the 24oz ice brix. 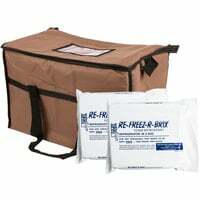 We operate a food delivery service and store safely 10 meals plus ice packs in each insulated bag. Not such a big fan of brown on these coolers. Just tends to look a little unelegant and I find that the other colors are more appealing.